A local charity which uses dance to help those with learning disabilities gain social and communication skills is seeking Beckenham volunteers to help out in its weekly sessions. Magpie Dance, which has been running workshops and dance classes for people with learning disabilities for over 30 years, are based at the Churchill Theatre in Bromley but hold three sessions a week at Langley Park School for Boys on South Eden Park Road. 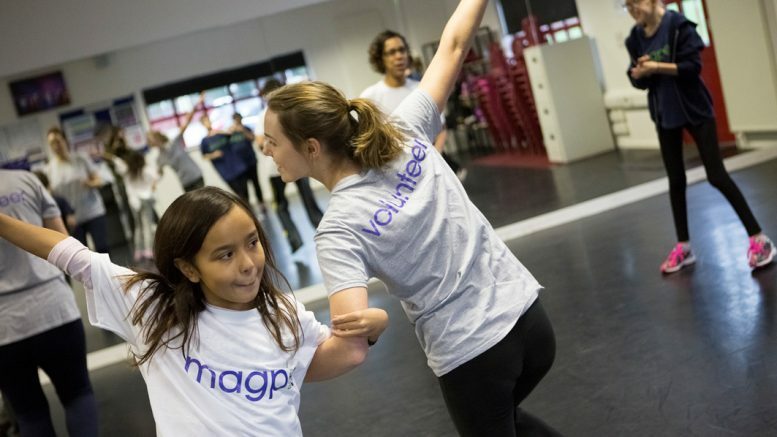 As a small charity that does not receive regular funding, Magpie Dance relies upon volunteers to help support its team, as well as the participants in sessions. Participants have a range of learning disabilities and are aged anywhere from eight plus. Through dance they gain life, social and communication skills as well as measurable health and wellbeing benefits. A Magpie Dance spokesperson told News in Beckenham: “Sessions are accompanied by a live musician, with two fully trained DBS members of staff; they are carried out in a safe environment where parents can drop dancers off knowing that they will be looked after – and most importantly will learn new dance skills and have fun. Magpie Dance are looking for friendly and reliable local volunteers to help out in sessions, distribute publicity and organise one off events. No dance experience is required and travel expenses are reimbursed. Those who are interested should email info@magpiedance.org.uk or call the Magpie Dance office on 020 8290 6633. Be the first to comment on "Dance charity for disabled people seeking volunteers"